Combining passion for visual art with that of motorsports is not as unusual as one would think (e.g., Kevin Page, John Thawley, and Masha Pasichnyk). Nevertheless, I have never known of an art historian who fused their vocation with motorsports but I managed to find a way for both passions to coexist. Inasmuch as I can find historical, design, and scientific commonalities between art and Formula 1 (my favorite motorsport) there is little I can build upon to create a cohesive branch of art history, to my satisfaction. Instead, I decided to sponsor the University of Washington's Formula Motorports team through the CORAI Project and individually collaborate with other motorports related causes from an art-related angle. Never, during the foundation process of CORAI, did I think about collaboration between it and motorsports. Now into this endeavor, I can see it was a matter of time until it happened. UW Formula Motorsports 2018 Team 29 eCar, with CORAI logo on lower right hand corner of wing. I grew up in a home where motorsports were important part of family entertainment and a fun exercise. Both my father and brother were motocross racers and avid general motorsports fans. I was allowed to practice on my brother's dirt bike and, from time to time, assisted my dad with mechanics during the weekends at home or at races. My dad taught me to drive manual transmission cars at age 4 and by the time I got my first car, a bottle green 1997 convertible Chrysler Sebring, I was the only one amongst my friends who could do all the basic mechanical maintenance by herself. Smelling like petrol smoke and grease was our usual musk at the end of these days -- even as an adult who spends her days in highly sanitized museum/gallery spaces, those smells (that usually give anyone a headache) make me feel saudade. 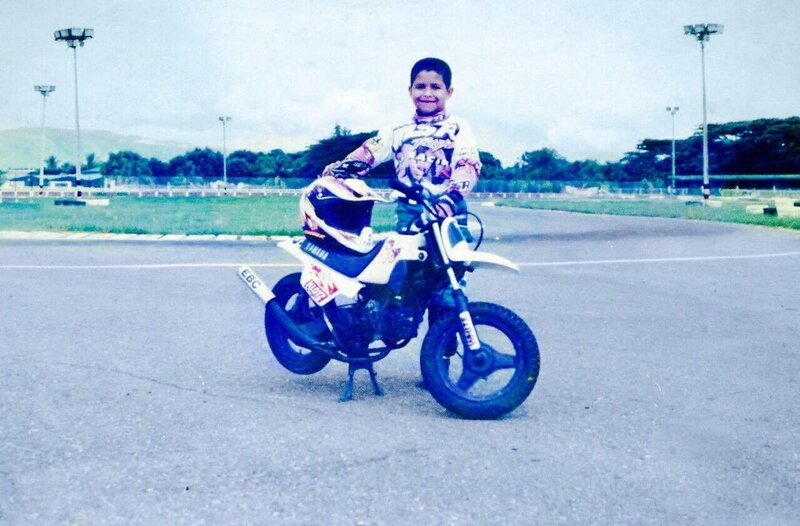 My little brother, Eduardo, on his Yamaha PeeWee (which he let me ride sometimes). To this day, I can barely wait for March to November Sunday races. (I must admit that I've become a fan of Formula E so my weekends are getting more exciting as the years go by.) As a child I used to watch Formula 1 races with my dad and sometimes we needed to wake up in the middle of the night to catch a race. I remember that horrible April/May weekend in 1994 and still recall my dad watching the news the next day -- Ratzenberger and Senna will remain in my memory until time decides to take it away. I remember the pride of seeing a Colombian pilot win a Formula 1 race for the first time, set the fastest lap at Monza in a Williams FW36, and fantastically duel Schumacher on the track everytime he could (¡gracias Montoya!). However, in the world that I made for myself there is little space for motorsports. My museum work has focused on children, historical, contemporary art, and natural history institutions not transportation; my art history research threads on ivory tower paths, as much as I tailor it to my interests; and my 'extra curricular' activities focus on art and culture with a dash of sociopolitical justice. I haven't owned any type of vehicle in more than 8 years (but I thank you Zipcar) and can only watch weekend races when time permits as most museums have weekend events and other community programming then. As I start to move away from arts & culture institutions to do other types of work, it is my hope to bring back motorsports into my life. Just like I created CORAI to bring light to those voices whose knowledge has been ignored or repressed in art history, I want to use it to also support youth-at-risk, minorities, and girls/women who have an interest in a male-of-a-certain-background-dominated industry, like motorsports, a 'bump' of encouragement and access to resources to reach their goals. I want to see less girls/women discouraged from racing, engineering and other science fields, etc. I believe in STEAM and the wonderful benefits it can have on the global community. We need new sources of ideas, distinct from the status quo; It is the difference in ideas, perspectives, critical thinking, and personal backgrounds that give way to groundbreaking change, as long as there is openness and respect from all involved. I have hope I can keep my two interests (arts & culture and 'the need for speed') harmoniously involved with each other for a long time. Most importantly, I hope that in the process others benefit from this... more than me. I am proud and honored to have been invited to write an introductory essay on Visual Midrash for Robin Atlas and Nancy Current's exhibit catalog, On the Consequences of Hate Speech. The exhibit by the same name is currently hosted by the Bowen Island Arts Council at the Gallery @ Artisan Square (British Columbia, Canada) until June 11. This exhibit and catalog are possible with the support of the Jewish Art Salon and the American Guild of Judaic Art. The opening on May 17 was a well-attended event where the guest of honor, Minnijean Brown-Trickey, "reflected on her experience at Central High, and all the work she's done as a social worker, civil rights activist, parent and mentor since then." I missed it, but I am happy that many people went and listened to the artists and Minnijean. Hate speech has grave consequences but we have the power to change things -- Minniejean sets a great example for all of us. On the other hand, I found my essay in fantastic company! the great thinkers and visionaries who collaborated on this project are: Spirit Trickey, Yasmeen Nayfeh, Jacqueline Massey, Jude Neale, Natasha Boškić, Rosemary Nowicki, and Rabbi Lord Jonathan Sacks. To purchase the catalog by Vector Artist Initiative Press click here. May we all be kinder to each other, listen more to each other, and be more attentive to our world. Geraldine Brook's People of the Book - Fiction based on what we know or suspect of the Sarajevo Haggadah. More info here. Javier Sierra's The Master of the Prado - A fiction novel based on the history and some of the juiciest secrets of El Museo del Prado. More info here. Dr. Kellie Jones' EyeMinded: Living and Writing Contemporary Art - An intimate look into art historian Kellie Jones and her family's history and how it informed her curatorial perpective. More info here. Flavio Febbraro + Burkhard Schwetje's How To Read World History In Art - Exactly as the title instructs. More info here. Remember, just because art is at the beginning of art history does not take away from our understanding of world history. Butterfly effects and echoes... there is always a starting point not seen or understood when you are in the middle of a historical shift. 50 to 100 years later it clears up, however. Our egocentric human nature usually drives us to make grave mistakes again, collective memories are a fickle and manipulable thing.